Giving Pills to Your Dog: How Do You Do It? There's a lot of talk about pills and supplements here at Tripawds, like this conversation from 09/08. And as you all know, pills don't exactly taste good. Most of us dogs will do anything we can to avoid taking them. Hold the pill in your dominant hand between your thumb and forefinger. With your other hand, gently squeeze your dog’s back teeth and lift his jaw toward the ceiling. Using a free finger on your dominant hand, lower his bottom jaw, place the pill on the back of his tongue, then hold his mouth closed. Blow on his nose. If he licks it, the pill is gone! Hmmm…seems easy enough for us to tolerate. What do you tink? How do you give pills to your pup? Cream cheese? Peanut butter? A Kong? Pills hidden in pizza? Check out this existing topic has great suggestions for getting dogs to take their medication. Liverwurst and cream cheese are other suggestions that often work, as well as the Pill Pockets. 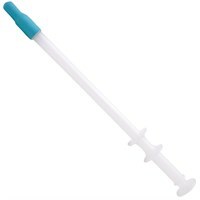 Dr. Patty Khuly also wrote about Drug delivery methods for picky pets and why they matter in her Dolittler blog a while back. I've tried pill pockets, deli meats, peanut butter, regular butter, and cream cheese. The only one that had a zero success rate was the pill pocket. I am sticking with the cream cheese because it sticks to the pill so you can use less of it, and it comes in a variety of flavors! I'm a peanut butter fan, myself. My trick is to use a plastic knife (the kind for picnics) and use the handle portion to glob the peanut butter (while holding the ridged end). When they open their mouth, I scrape the knife handle behind their teeth so the peanut butter sticks to the roof of their mouths. I've never had a pill fall out yet. And I never had anyone complain. Plus, I don't have to touch any slobber or gooey stuff! I used to do sliced cheese but that didn't work with tramadol since it is super bitter. I know someone that cuts up bite size wieners and make theirs own pill pocket with their fingernail. I'm too cheap for hot dogs every day! Sadie never had trouble with pills. A little peanut butter was all it took, until….tramadol. I put it in peanut butter, hot dogs, hamburger, cheese, I crushed it and put it over wet food (that was the worst) Finally I discovered pill pockets. 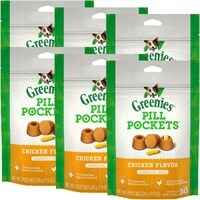 I think every dog is different, but for Sadie it was all about the pill pockets. There was one day after her surgery while she was still in the hospital that all she would eat was pill pockets. So, give them a try and if they don't work, sand them to Sadie! Holly’s usual is peanut butter. But the tramadol didn’t always work in that, and she wasn’t liking her anti-nausea pills in that (I’m wondering if they’re bitter, too?) (she took metoclopramide). Once she gets something that tastes bad in peanut butter she won’t take it again for a few days. Then I use the pill-on-the-back-of-the-tongue method, which usually works. Sometimes she gets really stubborn, though, and will not swallow! I’ll have to try the trick of blowing on her nose – maybe that’ll work! Stroking her neck/throat sometimes helps, too. Great suggestions here, though – I feel like now I’ve got lots of options to try – hot dogs, pill pockets, deli meats – all worth trying if PB won’t work! For Tehya I bought the big box of perogies from Costco and would cut them in half and hide the pills in the middle. I always let her see that there was more to come and she would just gobble them down without chewing (but then she was a Golden). Worked like a charm and very cheap to do. It just took a little bit of time to boil up a few every couple of days. her anti-nausea pills in that (I'm wondering if they're bitter, too? OH, Holly's mom I dare you to TRY ONE! And you’re anything but generic to us, Cool Cat Comet! My biggest challenge in the past with Maggie is that she chews almost everything. Once she finds a pill hidden in any food she won't eat that food for weeks. And she is so little that pill pockets are to big for her- she chews them up and finds the pill (that is when she used to even try them). I have found lately that the back of the tongue method works the best when she won't take food, which is frequently the case now. I call it pill stuffing. I have tried hiding pills in all kinds of foods, sprinkling on food, and pill shooters, she has always been really difficult. The trick with Maggie was to get the pill hidden in something small enough that she would swallow it, not chew it. I have had to split pills in the past since almost anything is too big for her not to chew. What has worked for us sometimes is melting a little piece of cheese (I use cheddar) in the micro for a few seconds- just to get is soft and oily. Then wrap the pill in just enough cheese to cover it. I give Mag a small, clean piece of cheese first, and if she swallows then the piece with the pill. The advantage with this I have found over cream cheese is that the melted cheese is not sticky, and is in fact slippery. So even if she won't take it on her own is slides down pretty easy when I have to stuff it down. We have used cream cheese, liver sausage, peanut butter, and Paris’ favorite was bananas….she loved her fruits and veggies!! You have to get creative, I know what Karen means, if Paris chewed too much and found the pill that was it, we had to start over. Add Reply: Giving Pills to Your Dog: How Do You Do It?